Cobblers and crisps are the highlight of summer desserts for me. I love that so much fresh fruit is available, that you can mix and match fruits based on what you have on hand and I love how easy they are to prepare. If I had to pick a favorite, it would definitely be peach cobbler. After all, I did grow up in Georgia! The farmer’s markets here have been overflowing with South Carolina peaches. After a few weeks of eating peaches plain, with yogurt and on oatmeal, I developed quite a craving for peach cobbler with ice cream. I prefer cobblers with a biscuit topping rather than the pie crust topping and this recipe from Southern Living looked perfect for my peach cobbler craving. It was very easy to assemble (like the name implies) and the most time intensive part of the whole process was peeling and slicing the peaches. I halved the original recipe because it would be trouble if we had a whole batch in the house! The half recipe was perfect for about five servings. 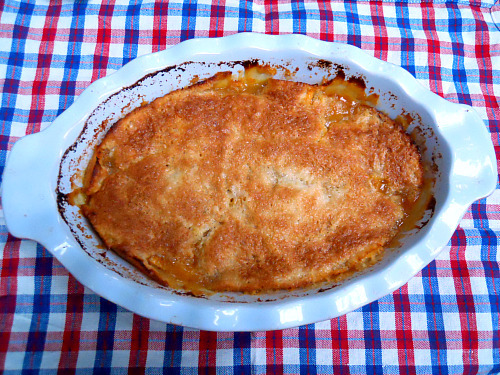 This peach cobbler was wonderful served warm with a generous scoop of vanilla ice cream! I will be keeping this recipe on hand for when I need a quick cobbler fix! Melt butter and pour into a 13- x 9-inch baking dish. Combine flour, 1 cup sugar, baking powder and salt. Add milk, stirring just until dry ingredients are moistened. Pour batter over butter (do not stir). Bring remaining 1 cup sugar (I reduced this a bit – used more like 3/4 cup), peach slices and lemon juice to a boil over high heat, stirring constantly. Pour over batter (do not stir). Sprinkle with cinnamon and nutmeg if desired. Bake at 375 degrees for 40 to 45 minutes or until golden brown. Serve cobbler warm with ice cream.